I love all the colours and imagery surrounding Halloween (well, the more cutesy side of Halloween) but it really isn’t a big deal here in Australia. There’s no real need to make Halloween cards but I just couldn’t resist. I pulled out a set from There She Goes Clear Stamps which I purchased last year. (Unfortunately, There She Goes Clear Stamps is no longer in business. Such a shame as they had the cutest designs.) Although I had played with the set a bit last year I never actually finished a card or project using it so it was time to remedy that situation. A lot of my cards tend to be scene type cards. I love making them! I thought about making a cute little scene but decided to stretch myself and try something very simple. Sorry, I’ve been wrapped up. Materials used: Stamps – Hauntingly Delightful (There She Goes Clear Stamps), Happy Haunting (Lawn Fawn); Designer Paper – The Bewitched Stack (DCWV); Copic Markers; Cardstock – Assorted; Linen Thread (Stampin’ Up!) and Glossy Accents (Ranger). I know Halloween is tomorrow but I think I might keep playing with this set. It’s too cute to put away for another 12 months. Really this sentiment (and many others in the set) could be used at any time of year. Gotta love a versatile themed stamp set! Wow, Kylie, I love this!!! wow…you are just amazing! 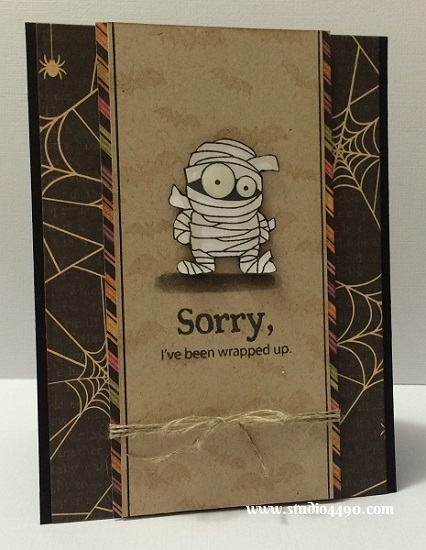 What a fun and fabulous card, I love your sweet little mummy, they do not come any cuter than this. Oh well done, Kylie!!! This is the cutest, most non-scary little mummy ever!! Just love your design too. Another brilliant creation….hmmm…maybe you need to change your blog name to “Another Brilliant Creation by Kylie…” For realsies, because every time I visit, I see another stunner!!!! Darn cute! Thanks so much, Bev! Was fun to try something a little different. lol I think I might disappoint if I change my blog name to that. lol Love and appreciate the compliment though, Bev! hugs!